Sara and Charlie’s October 21st wedding had all the fall feels to it! Along with the cool weather, the colors in the Blue Ridge Mountains, vineyard, and trees changed drastically to their vibrant orange, yellow, and red autumnal colors. 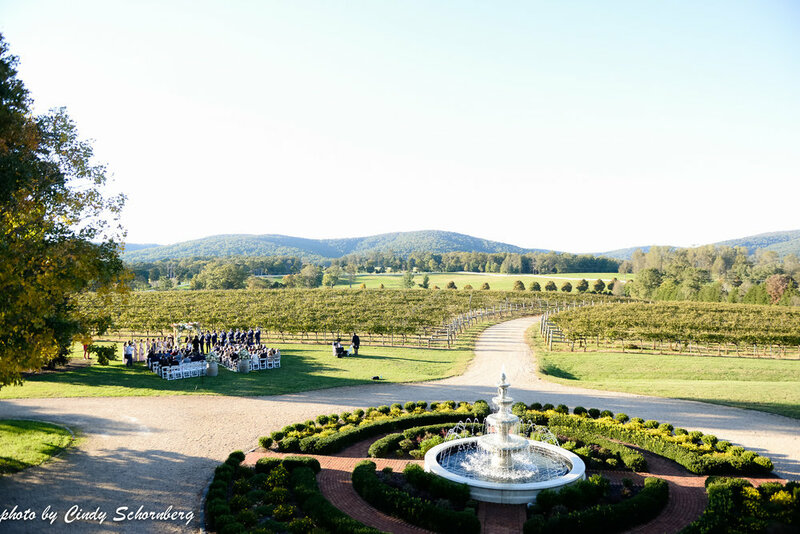 Needless to say, we really felt the season’s tidings at this Keswick Vineyards’ wedding! The fall colors complemented the beautiful green and white colors that Sara and Charlie’s florist (who drove all the way from North Carolina!) decked out the ceremony space with. On the wooden pergola was white drapery with a plethora of roses and other flowers adorning it. The ceremony space was absolutely romantic with the sun beaming behind Sara and Charlie, and of course, Chancey, their designated ring bearer/pup, enjoying every second of his parents’ marriage. One of our favorite details to this wedding was the oyster bar that was setup for guests during cocktail hour! 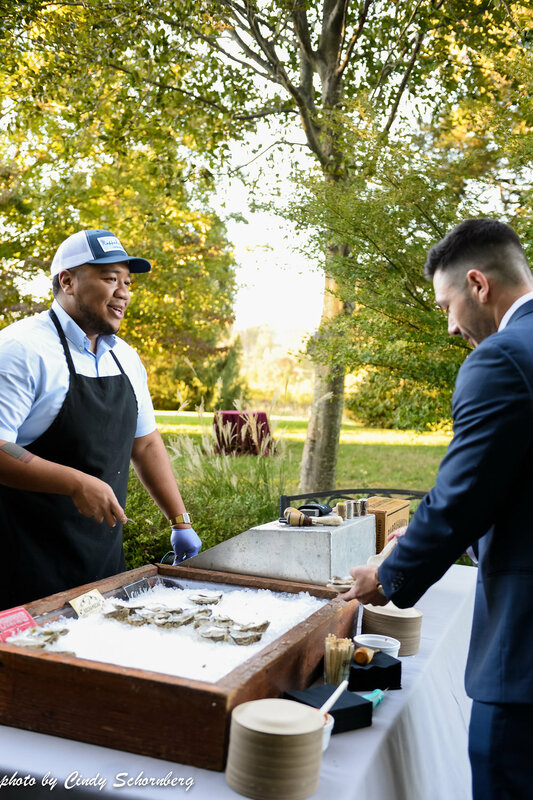 A representative from Rappahannock Oyster Company shucked three types of oysters for guests to enjoy along with their cocktails. It’s not every day that you see oyster bars at weddings! Another item that you don’t see at very many weddings are cork place cards. 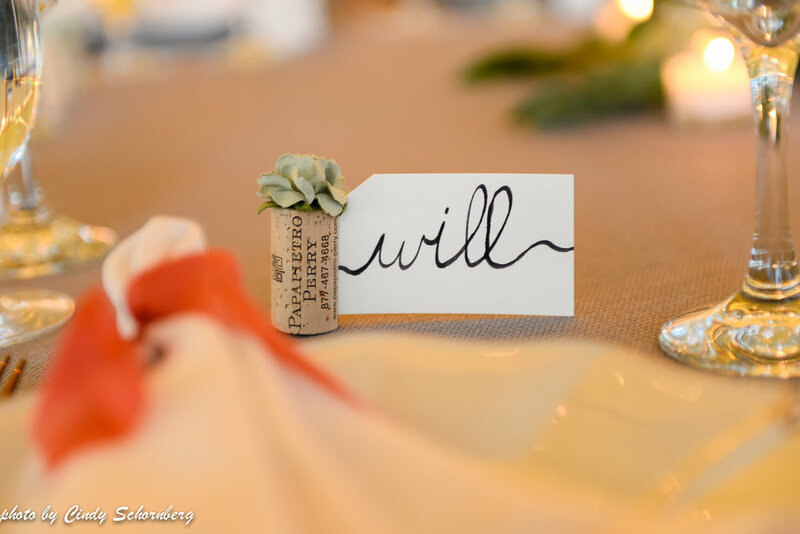 Sara and Charlie wrote, in cursive, place cards for all of their guests that was attached to a wine work. On each wine work, though, was a little succulent atop it. It seems as though succulents are a trend this year, but we haven’t seen them incorporated into wine corks! Congratulations to a sweet couple on their marriage! We hope that you two (and Chancey) enjoy your lives together! Wedding Planner: Hannah Dubit with Exchange Events, Officiant: Charlie White, Caterer: Exchange Events, Desserts: Sweethaus, DJ: Derek Tobler, Photographer: Lauren Rosenau, Videographer: Joy Gaba, Photobooth: Mox Box, Hair and Makeup: Gohar Beaver and Jeanne Cusick, Florist: What’s Up Buttercup, Transportation: Easy Riders, Rentals: MS Events, Lighting: Skyline Tent Company, Oyster Bar: Rappahannock Oyster Company.